Installers offered directly from carpet retailers are usually the best option, since retailers have extensive years in business and choose only trustworthy professionals to represent them. General contractors, on the other hand, may have good contacts for carpet installation, or they may go with the cheapest service available, which isn’t good for finished results. 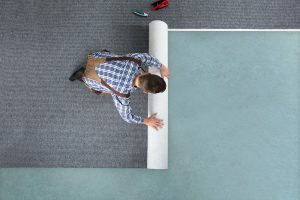 Licensing: Any carpet installer worth their reputation should be properly licensed, which means they’ve taken the time to go through an apprenticeship. Insurance: Carpet retailers always use teams that are properly insured, and so should good independent carpet installers. If something gets damaged, your home is protected. Experience: Installers who have produced perfect results for many years are worth their weight in gold when it comes to beautiful carpeting that wows guests. Previous projects: If possible, request to see photos of past projects. Great results speak for themselves. Price: Budget is a factor in many projects, but remember that you get what you pay for. Going with the cheapest option gets the job done, but at what cost? It’s usually better to choose an intermediate price or the carpet installation option that brings the most experience to the table. Trying to install carpet yourself can quickly turn into a disaster, due to improper stretching, poor adherence and frustrating accidents. Enjoy beautiful, worry-free carpeting by choosing a great installer to do the work for you.